Once upon a time,there was a debate in the beauty corner whether it is necessary to wash your face in the morning. Even though some dermatologists said it was not necessary, but they also said there’s nothing wrong with washing your face every morning. I have combination skin with oily face in the morning, so I prefer to wash my face every morning. You know, I can’t stand to put my SPF directly to my a little bit greasy face. However, over-cleansing is harmful for our skin too, thus all cleansers & Washes I used in the morning should be gentle and natural. Here I will talk about the best gentle facial cleansers & washes I have ever used in the morning . 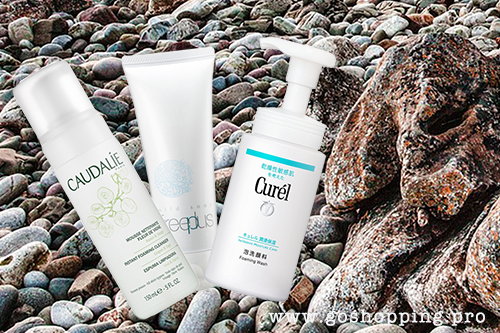 Caudalie is a natural brand from France which is famous for their grape-related skincare products. Personally, I have used their serum and cream as well which are all gentle and suit for sensitive-skinned girls. This foaming cleanser contains Glycerin alongside water, which is known as a moisturiser. It also contains grape extracts, sage, and chamomile which can help to make your skin calm and fresh. This cleanser comes in liquid form, but it changes to foam instantly when you press the top. One pump is already enough for me to clean my face. The foam is so thick that I feel like every cell of my skin has been genteelly touched. It is not fragrance-free and it has a bit grapefruit scent. I love this scent! Whenever I do this my skin feels clean and fresh(but not stripped.) The only cons are that it runs out so quick that I have to grab a new one within 1 and half month. They change the appearance recently(used to be transparent), but the feeling is the same. Even though it is designed for dry/sensitive skin, it also suits for oily/combination skinned girls to use in the morning. In fact, Curel is a popular addicted-free high street brand in Japan (another addicted -free brand I talked about before is Haba).You should hear about Curel before if you have interest in Asian Beauty. This foaming wash’s ingredients include glycerin( the same as Caudalie Instant Foaming Cleanser) , maltitol, propylene glycol and PEG-150 which are common moisturizers. It also contains Potassium Hydroxide to adjust PH. 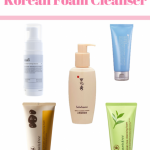 I’ve noticed a trend towards weak acid cleanser recently. Yes, this one is wearing acid cleanser which will help to maintain skin’s natural PH.Take 2 pumps of it, massage in and rinse-off, it cuts through dirt and oil without stripping. My skin feels smooth, hydrated and even brighten whenever I use it. It is fragrance-free and can last for 3 months. This cream cleanser is so-called AHA cleanser which is low-irritation that good for both sensitive and acne-prone skin. As I said above, it is also a good choice to use in the morning for its gentleness. It contains glycerin, potassium cocoyl glycinate to keep moisture level of your skin. 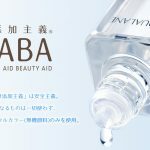 The ingredients also include some plant extracts such as hatomugi extract (another skincare product I introduced before is hatomugi skin conditioner). It has quite a thick, creamy texture but easy to turn into bubble and rinse-off well with water. My skin feels fresh and smooth without stripping. Even though it is fragrance-free, I feel a bit drywall powder scent just like some other AHA cleansers. All in all, those 3 gentle facial cleansers are mild enough to use in the morning. For sensitive/dry skinned girls it also works. 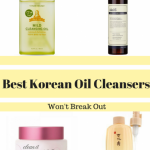 They will help to clean your dirt and oil without drying your skin. Let me know if you’ve tried any of the above, or any other good facial cleansers to use in the morning in the comment. Thanks so much! Caudalie Instant Foaming Cleanser is so good for my sensitive skin! I gonna try another two later! Thank you for your support x!